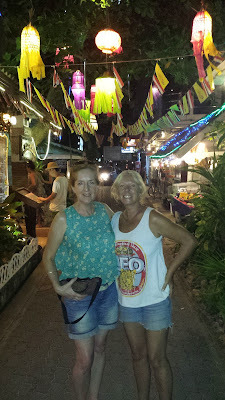 At the end of my previous blog post written just after New Year – a summary of our travels in 2016 that you can read by clicking HERE – I mentioned how we had no immediate plans to leave Koh Tao in Thailand. But that all changed very quickly on the 4th January when we had word that my mother-in-law was gravely ill.
We checked for flights back to the UK straight away - but as it was still peak time for new year holiday travel - we had problems with availability. We left Koh Tao by boat and bus and plane and headed to Kuala Lumpur, Malaysia, where we knew there was a flight to London with British Airways the following day, on which could be on standby. We managed to get the last two seats on a flight back to the UK via Hong Kong. We were hoping to get back to the UK in time to say goodbye to Trav’s mum before she passed away. Trav was on the phone several times a day with his mum’s nursing carers, and the good news was that his mum had improved slightly, so allowing us more time to get back to her. The bad news was that we heard Trav’s dad had fallen and badly broken his hip. He was now in hospital and due to be operated on the very next day. Then from London we flew straight up to Glasgow because our son, Iain, had kindly allowed us to use his car to save us the cost of car hire. We also managed to see our son, Ben, while we were in Scotland. 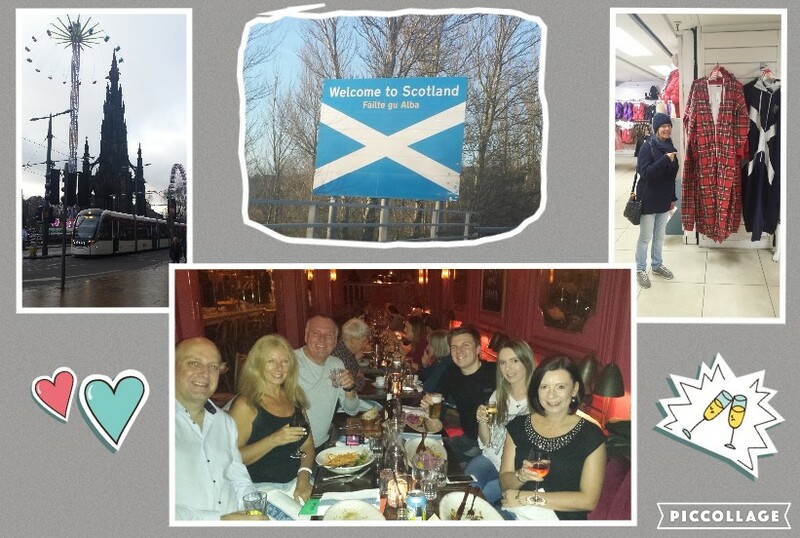 We had a meal out on the night we arrived in Edinburgh with him and his girlfriend Hayley and her family. I hope they didn’t mind that we were suffering from climate change, we were totally jet lagged, and hadn’t slept for 48 hours! It had been two years since we’d been back in the UK and it felt quite surreal to sudden find ourselves back there. I had been missing my family very much over the Christmas holidays, so I knew this albeit unplanned trip would be bittersweet time, because it would be wonderful to see family and friends again but very sad indeed to see Trav’s dad in hospital and his mum for what would be the very last time. We had been warned she was now in the last days of her life. After buying some warm clothes and footwear more suited to the UK in January, we headed down to England, shivering under gloomy grey and rainy skies. 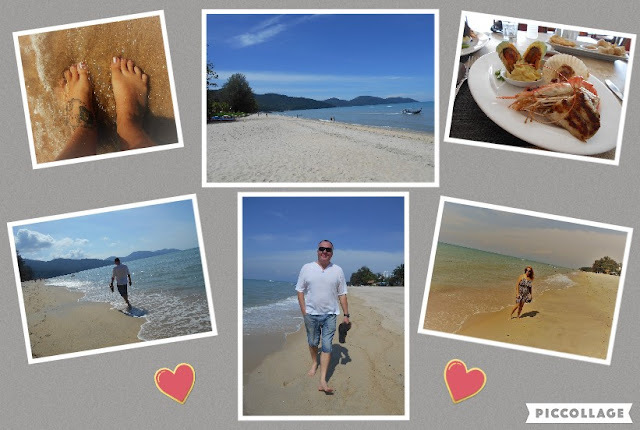 I couldn’t help but to think of the sunshine we had left behind us in Thailand – until I checked my Facebook notifications to discover that the very day after we left Koh Tao a monsoon had hit – bringing the worst rainfall in decades. I’m sure that as we had left so quickly and unexpectedly some peeps might have thought we knew something was about to happen – but we didn’t – honest! Once in England, we visited Trav’s mum and dad, who were in two different locations: Whiston hospital and a Runcorn nursing home. My best friend, Dina, who happens to live an equal distance between the two places, kindly said that we could stay with her for which we were extremely grateful. Often, while Trav was with his mum and dad, I went to visit my mum and it was so wonderful to spend time with her. I also got to catch up with my brothers and sisters. It was hard to arrange to see everyone during this unplanned trip, even though we were back for a month, when everyone worked during the week and often had plans over the weekend. 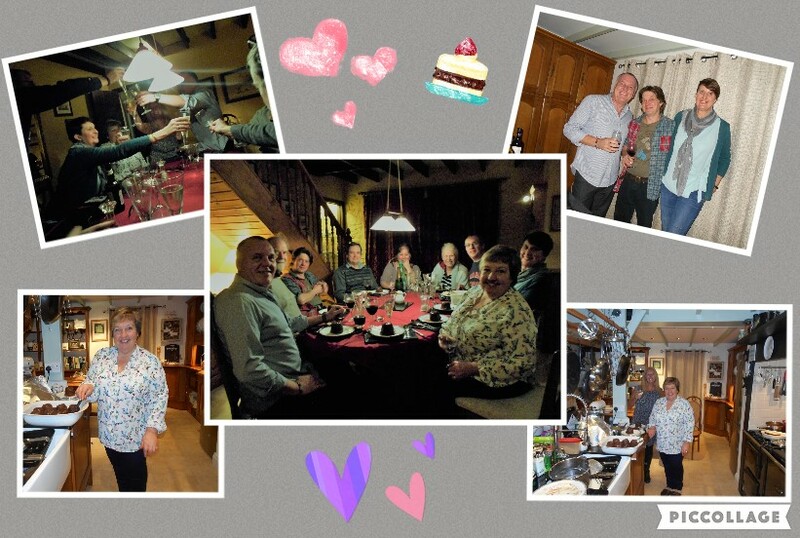 I did manage to have a meal out with my brothers one evening and to spend a couple of nights with my sister Lorna and her family at her house. Sadly, on the 17th January, with her three sons and daughter-in-laws at her bedside, Trav’s mum, Dorothy Horton, passed away peacefully in the early hours of the morning. She was 84 years old and she had been suffering with dementia and Alzheimer’s. She hadn't known or recognised her family during her last months but, in the moments before she drew her last breath, I saw her open her eyes, shed a tear, and look with absolute clarity upon her boys. Sadly, as my father in law was still recovering from his hip operation, he wasn’t able to be with his wife at the end. As you might imagine, this made for an extremely difficult and emotional time, when we had to break the sad news to him later that day at the hospital. 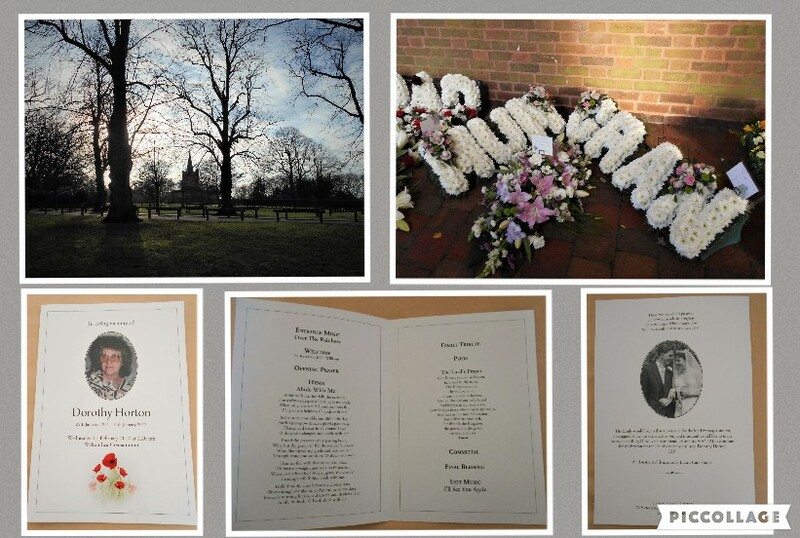 The funeral couldn’t be held for another 15 days due to the Christmas and New Year holidays and with January apparently being a busy time for the funeral services generally. This posed a problem for Trav and I as we had a return flight to Asia booked a couple of days before the funeral date. We spent a long time on the phone speaking to several departments within British Airways until we finally got someone who could help us. 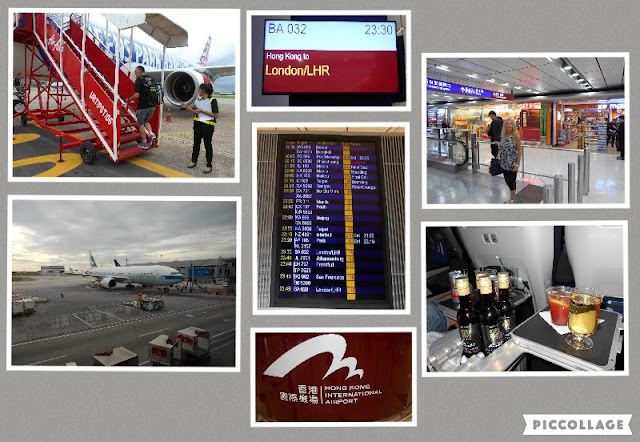 BA were more than helpful and, although there should have been hefty charges associated with changing our flights, they wavered all of them and moved our flights forward by one week to allow us to attend the funeral. During the next two weeks, we continued to stay as house guests at my lovely friend Dina’s house. As we hadn’t seen Dina since she had come out to see us in Koh Tao the previous January. It was wonderful to see her again. Trav and I were aware that we needed new visas to get back into Thailand, so we made a trip into Liverpool to the Royal Thai Consulate there. I hadn’t been to Liverpool for decades and yet I had been brought up there. My family moved to Liverpool when I was 6 years old and moved out of Liverpool to Runcorn when I was 14. I have to say that the Liverpool I knew back then is a far cry from the rather swish cosmopolitan city that it is today. 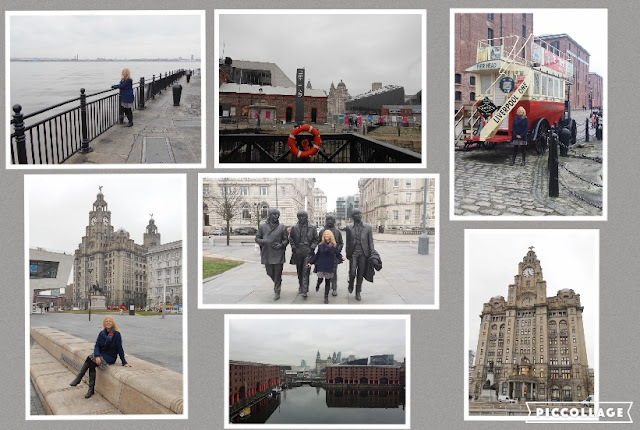 I immediately wished we’d been able to spend more time staying in Liverpool at the Albert Dock than the one night we had planned. Especially when a lovely friend who we met on the island of Utila in the Caribbean last year – who plays with the Liverpool Philharmonic Orchestra – got in touch on Facebook messenger and offered us ticket for the following evening’s performance. We did however manage to catch up with a couple of lovely friends who we’d met a couple of years ago while we were in the Bahamas. Jen and Gregg live in Liverpool and are planning to come out to Koh Tao in March to see us and do some diving – so it was great to meet up with them in Liverpool while we were there. They showed us a great night out in the city. 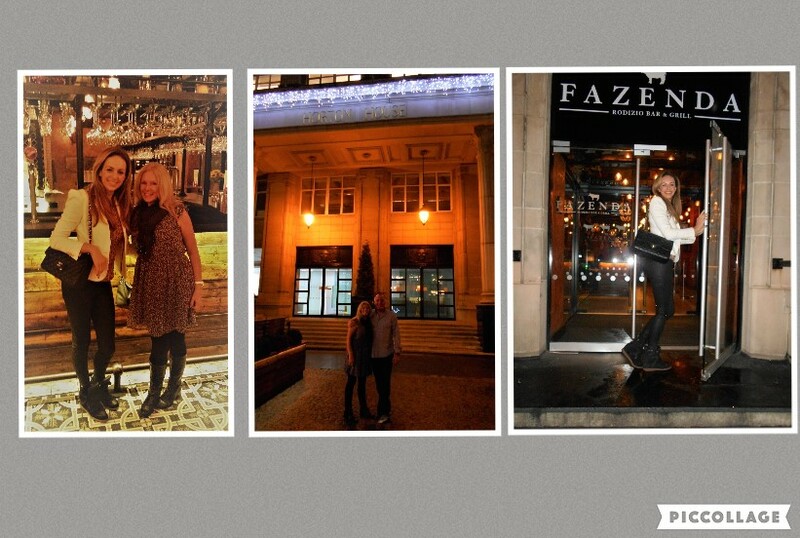 We stopped outside Horton House for a photo and went on to a fabulous Brazilian all you can eat restaurant called Fazenda followed by a cocktail bar called The Alchemist where the cocktails all look like science experiments! We also managed to catch up with our closest friends Jeannette and Nigel and Sara and Douglas and Jane and Pete in Scotland. It was so wonderful to see them again and to catch up with each other over a wonderful dinner that Jeannette cooked for us all. While in Scotland, we also briefly go see our eldest son Ben again in Edinburgh and to stay with my sister Lisa and her family who live in Ayrshire. 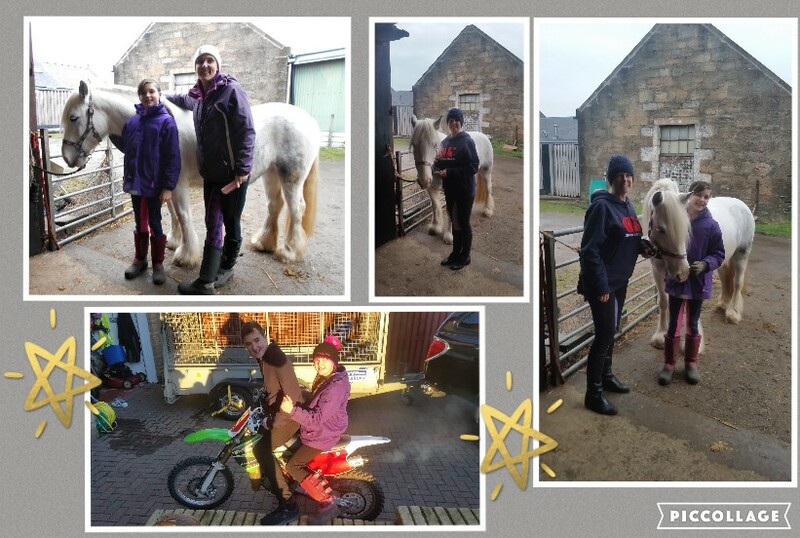 While staying at Lisa’s I was very keen to have a ride on my niece Shannon’s new pony. Her pony, called Star, was her Christmas gift. Lucky girl! Then we returned to England for Trav’s mum’s funeral. It was a sad and poignant day. Again we were able to meet up with friends and family we hadn’t seen in a long time. Unfortunately, Trav’s dad wasn’t able to attend, as he was still too frail and that made for an even more difficult and emotional day for the family. After a service at the crematorium everyone gathered at a nearby old Cheshire pub that is opposite All Saint’s Church in Daresbury. The church is famously the burial place of Lewis Carol and there is a beautiful stain-glass window there dedicated to Alice in Wonderland. Trav’s mum’s funeral. It was a sad and poignant day. The day after the funeral Trav and I headed back to Asia with heavy hearts. We decided we needed some down time before heading back to the island of Koh Tao and our busy lives of teaching diving and writing projects. We decided to take a short diversion and fly over to the island of Penang in Malaysia. It is very easy and inexpensive to fly to Penang with Air Asia from Kuala Lumpur and it's a place we had yet to visit. Not that we planned to explore much – that would have to wait for another visit – we just wanted time to rest and recuperate and to get over our hectic and stressful month and from the jetlag of travelling. We were very fortunate, due to Trav being a card member with Holiday Inn - that we were given a fabulous top floor suite upgrade for the three nights of our stay and so were able to get our R and R in absolute luxury! Next time on the blog I’ll be back on Koh Tao in Thailand. We have lots to do there – Trav is heading up a team of Dive Master Trainees and I have a new book to bring out soon and another to start writing. So pop back soon for island updates and writerly news and please do consider joining my 2017 mailing list. Every new subscriber will receive a free copy of my bestselling ebook 'How To Party Online' just for signing up to my occasional newsletters by using the form at the top right hand side of this page.